Genetic transformation has emerged as a powerful tool for genetic improvement of fruit trees hindered by their reproductive biology and their high levels of heterozygosity. For years, genetic engineering of fruit trees has focussed principally on enhancing disease resistance (against viruses, fungi, and bacteria), although there are few examples of field cultivation and commercial application of these transgenic plants. In addition, over the years much work has been performed to enhance abiotic stress tolerance, to induce modifications of plant growth and habit, to produce marker-free transgenic plants and to improve fruit quality by modification of genes that are crucially important in the production of specific plant components. Recently, with the release of several genome sequences, studies of functional genomics are becoming increasingly important: by modification (overexpression or silencing) of genes involved in the production of specific plant components is possible to uncover regulatory mechanisms associated with the biosynthesis and catabolism of metabolites in plants. 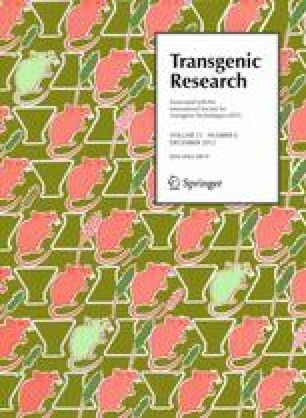 This review focuses on the main advances, in recent years, in genetic transformation of the most important species of fruit trees, devoting particular attention to functional genomics approaches and possible future challenges of genetic engineering for these species in the post-genomic era. Out thanks go to Mickael Malnoy (Foundation E. Mach, San Michele all’Adige, Italy) for providing photographs of transgenic apples.